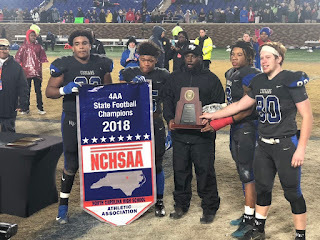 DURHAM, NC - The Wake Forest Cougars wrapped up a third consecutive perfect season with a 9-7 win in a defensive struggle for the 4AA State Championship with a tough Zebulon B. Vance team. Wake Forest nipped Vance with a safety in the final minute of the fourth quarter, surging into the lead for the first time late in the game and securing their 45th consecutive win. Vance jumped into the lead on the second play of the game when Nyier Clark hauled in a 53-yard pass for a touchdown from Nigel Summerville to give Vance the lead 7-0 just 23 seconds into the ball game. The two-time defending 4AA Champions from Wake Forest did not stay behind long, as after the teams traded possessions, Wake Forest mounted a 13 play, 52-yard drive that chewed up 5:45 off the first quarter clock. In typical Wake Forest fashion, the sustained drive was capped off by a three-yard touchdown run by Marquel Haywood, knotting the game at 7 with 1:36 to go in the first quarter. Neither team scored for the balance of the game, with two defenses locked in a tightly contested field position battle for much of the rest of the game. In the closing minutes, the field position flipped in favor of the Wake Forest side when a 22-yard field goal attempt to potentially win the game was blocked by Vance and recovered by Vance at their own two-yard line. In the shadow of their own goalposts, Vance mishandled the ball in the end zone, and in the chaos that ensued, the Wake Forest defense swarmed to the ball, tackling the quarterback in the end zone with just 32 seconds left for a safety and the decisive two points, lifting Wake Forest to a 9-7 win. Vance was led by Most Outstanding Defensive Player Solomon Sutton, Jr. who had eight tackles in the game. Nyier Clark was chosen as the Most Outstanding Offensive Player for Vance with his five receptions for 78 yards and the lone Vance touchdown. 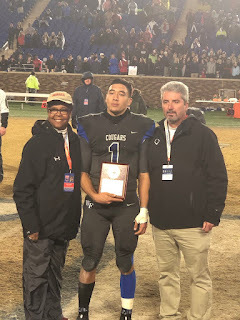 Wake Forest quarterback Mateo Sudipo was named the game’s Most Valuable Player with his 8 for 15 performance amassing 71 yards on the night. Sudipo also intercepted a pass on the night, returning it for 46 yards and had a pass break up. The Most Outstanding Offensive player for Wake Forest was Maquel Haywood who rushed ten times for 20 yards and the lone Wake Forest touchdown of the game. Chance Smith was tapped as the Most Outstanding Defensive Player from Wake Forest, leading the team with seven tackles including one sack.